If it is difficult to remove the cover, you can use your key. 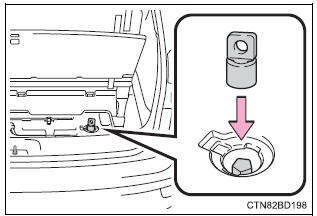 Attach the adapter socket to the spare tire clamp bolt. 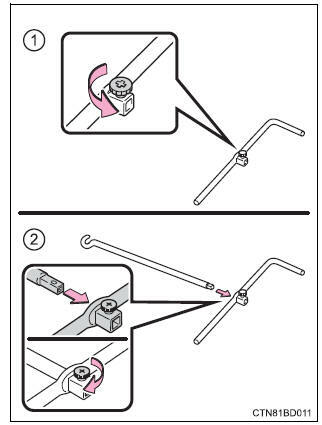 Remove the jack handle and assemble it by following these steps. Assemble the jack handle and tighten the screw. Check that the screw is firmly tightened. Connect the jack handle to the adapter socket. 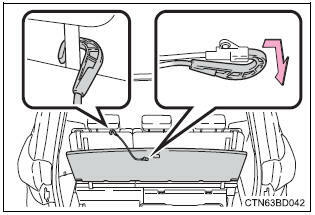 Turn the jack handle counterclockwise. 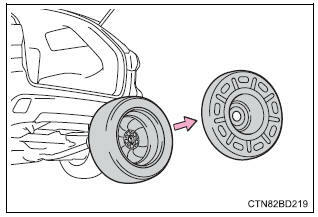 The tire will be lowered completely to the ground. 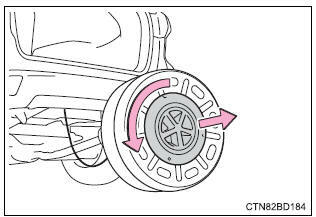 Turn the jack handle slowly to lower the spare tire. 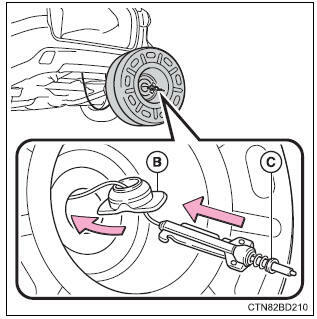 If the handle is turned quickly, the wire cable may slip off of the shaft inside the unit and the tire may not be lowered. 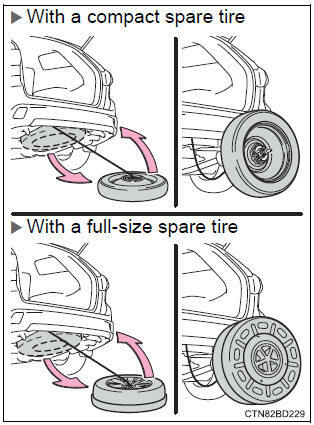 Pull out the spare tire and stand it against the bumper. 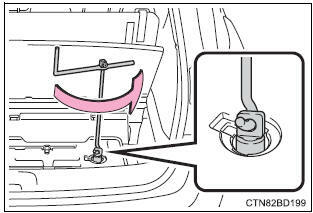 Fully depress the secondary latch (a) and remove the holding bracket (b) from the hoist assembly (c). 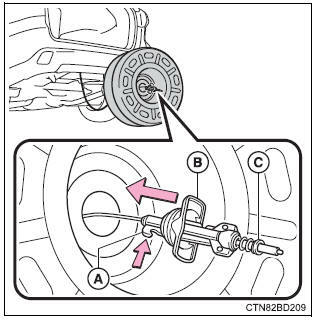 Tilt the bracket (b) and pass it through the wheel opening. 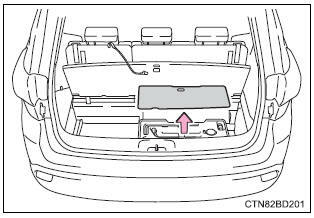 Then remove the hoist assembly (c). 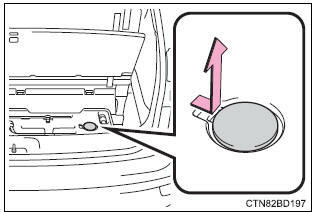 Remove the inside spare tire cover. 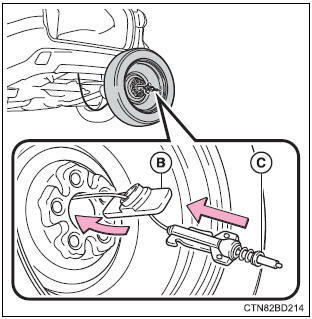 Tilt the holding bracket (b) so that it can easily be passed through the wheel opening. 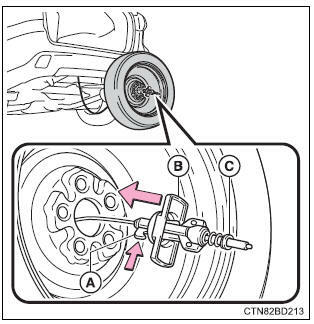 After passing the holding bracket through the wheel opening, remove the hoist assembly (c). 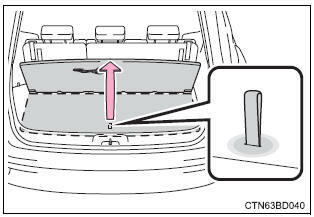 Remove the outside spare tire cover.